I had off last Friday so our family planned to use the long weekend to go camping at Killens Pond State Park in Delaware. We’ve only been camping as a family once before. That was three years ago in October at a state park here in Pennsylvania. That time, the trip was relatively easy, the temperatures were cool, the campground very conducive to newbies. We made some mistakes and learned some important lessons but overall it was a positive enough experience that we wanted to try it again. Things were a little different this time. We got a late start on Friday. We wanted to leave before noon but for various reasons didn’t get on the road until around 1 pm. There was nothing to worry about, though, as the trip was only supposed to take us around three hours, leaving us plenty of daylight to set up the tent, establish ourselves, and enjoy the evening. But things don’t always work out as planned. In fact, with this trip, little did. Our drive was going okay until we hit the Baltimore beltway. I-695 circles Charm City like a moody serpent. Come upon it at the right time and it’s as docile and harmless as a garter snake, but hit it while it’s waking up and you find yourself tangled with a python. And the deeper we got, the tighter that snake squeezed. At one point, it took us three hours to go twenty miles. Try being stuck in a car, in the rain, windows fogging, toddler screaming that she’s “done” with this trip, and all you can see is a four lane parking lot. 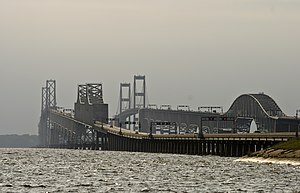 Finally, we got across the Chesapeake Bay Bridge (a bridge, by the way, that drives like a 4-mile long sidewalk suspended almost 200 feet above the bay) and found our campground around 8:30 pm. We wound up assembling our tent in the dark by the light of car’s headlights. Not ideal. In spite of our rough start we did manage to get a decent night’s sleep and set out Saturday for the Cape Henlopen State Park beach. The weather forecast had called for isolated thunderstorms all day but at the beach it was sunny and pleasant with a gentle breeze. We couldn’t have asked for better weather. But the sunny disposition of the shore lulled us into a false sense of hope regarding the weather back at the camp. In the woods it felt like we’d been transported to the deepest jungle in South America. Hot with humidity so thick you could spread it on bread and make a sandwich out of it. We could tell it had rained there while we were enjoying such perfect weather at the beach. We had no idea how hard it had rained, though. Not the words one wants to hear at 7 pm. Indeed, it had rained so hard the tarp covering our tent was not enough to hold back the water. So we made the decision to throw in the towel, pack up, and go home. We were done. Uncle. But first, determined to do something fun on the camping front, we made a fire and roasted up some smores. I learned an important lesson Saturday night. Packing up a wet tent in the sand is about as fun as wrestling a soaked dog in your church clothes. Will we go camping again? Probably. We don’t give up that easily. And you know what? We made a memory. We’ll be talking about this trip for years to come. And that makes it all good. Posted on July 15, 2013, in Family, Life in General and tagged Camping blunders, Camping trip, Cape Henlopen State Park, Chesapeake Bay Bridge, Delaware, Killens Pond State Park, Pennsylvania. Bookmark the permalink. 14 Comments. Camp and house painting are ways that I suggest to end droughts. Very true, Shawn. Very true. When our children were small we camped at Deep Creek Lake and it was a wonderful experience. Then since that was so great we camped on Assateague Island with the biting flies and floods and had to be towed off the island. We tried again, in Jamestown and came home with chiggers. It’s nice to get away but there is truly no place like home. I just read this and thought that sounded just like our family. Then, I saw who wrote it! HAHA!!!! They should put a skull and crossbones on the Baltimore Beltway! What a beast! On another note, we always camped when I was a kid. Seven of us in a big green tent! So many memories. One trip was so bad that my mom wrote a song and a bunch of poems about it! You should try Ricketts Glen State park, otherwise known as Lake Jean, Mike. We loved it there and still visit on occasion. They have a beach and many trails to hike including a trail of waterfalls! Awesome place! Amy, Ricketts Glen is where we went a few years ago and had a wonderful time! It is beautiful. We went in October and hiked the waterfall trail. Awesome. Hey, I don’t see my comment, so I’ll try to post it again. You WILL be talking and laughing about this for years and your kids will be laughing as they tell their kids. One time we went camping on Assateaque Island when I was little (in the 70’s). The way I remember it, there was a huge thunder and lightning storm and our Cairn Terrier got out of the tent in the middle of the night (and in the middle of the storm) and started chasing the wild ponies that were running past our tent. My dad had to go out looking for her, in the storm. The next morning after we packed everything up to leave, we discovered that our Volvo was stuck in the sand. We couldn’t find anybody to tow us because it was a foreign car. Oh, did I mention the horrible fly bites that I (and I think only I) had? But we laugh about it to this day! Wow, Beth, sounds like a trip to remember. These are the moments childhoods are made of. Great stories to pass along. So remember those days of camping. Yes, you will remember this trip for a long time. Glad to hear you will not give up on camping. We’ve hit the rainy ones and the good ones! And the good ones way outweigh the bad ones. But Mike, it’s a story your girls will probably remember for the rest of their lives and I expect in a positive light. You’re right, Ian. These kinds of events are usually remembered in a positive light. Amazing how our brain chooses to focus on the good memories.